To overcome damage to spinal cord or body caused by injury, stroke, or disease, technology is under development to create neural interface systems, sometimes called a brain-computer interface (BCI), to sense motor intentions and reconnect them to the outside world. Electrical stimulation devices that restore hearing to the deaf (cochlear implants), as well as interventions to stop the tremor and rigidity of Parkinson’s disease (deep brain stimulators) are already used by more than approximately 500,000 people. Furthermore, devices to restore some sight to the blind became available in 2013. These neural interfaces represent the beginning of an age of neurotechnology in which promising advances are being realized to provide a range of devices to diagnose and treat nervous system disease and restore lost function. In recent years, several tetraplegic people, who cannot move their body, have had tiny sensors, smaller than a baby aspirin tablet, implanted beneath their skull in the motor cortex, the brain area that generates movement commands. Each of the people in this ongoing, early stage clinical trial are unable to move their arms, body or legs. Even so, with the addition of the BCI linking the firing of a small group of motor cortex neurons to a computer interface, the subjects were able to make a computer cursor move as if they were controlling a mouse with their hand. The trial using this BrainGate neural interface has demonstrated how they gained the ability to type messages using only their thoughts to manipulate a cursor. BrainGate is still a very early stage technology with more testing and development required. 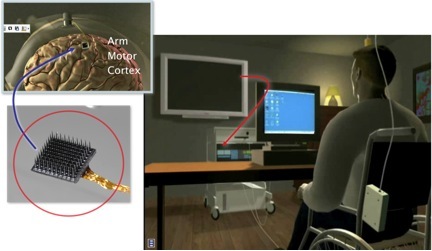 In 2012, steps were demonstrated toward a fully implantable system that can provide independence and control by connecting the brain signal to robotic arms to help with drinking, eating or grooming. In addition, work has advanced to connect brain signals with stimulators implanted inside the body and connected to muscles. Proof of concept of such a system was demonstrated in 2017. Damaged natural connections between the brain and muscle are bridged by the system’s hardware and electrical impulses, allowing people with paralysis to move their arms. While just beginning to be realized, this type of neurotechnology has great promise to enable activity for persons with severely disabling motion limitations. Even more people might benefit, such as people who experience limited paralysis after a stroke, or amputees wishing to optimize control of a prosthetic arm. Initial testing of those uses is also underway. Beyond that application, brain sensors that are able to measure minute changes in brain activity may also be used to monitor potential warning signs, such as possible onset of an epileptic seizure. These advances suggest an entirely new set of solutions is on the horizon that could treat a wide range of nervous system disorders and restore function – and life quality – for people with disabilities, their caregivers and loved ones. BrainGate neural interface system. The sensor, which measures 4 x 4 mm, is implanted in the motor cortex, where it detects minute electrical impulses signaling commands to move the arm. From initial human clinical trials we now know that these signals are present even long after spinal cord injury or stroke. The signals can be passed through a computer (red arrow) to be converted into a command the moves a computer cursor when the user thinks about moving it.